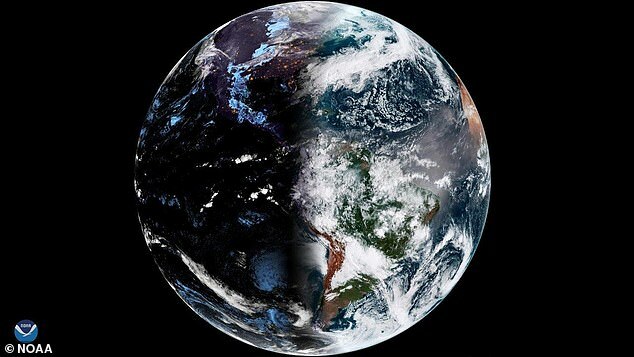 Earth in perfect balance between night and day has been captured in a stunning image taken from space. The breathtaking view was shot on the Spring Equinox, one of two times of the year where the Earth is neither tilted away from or toward the sun. This year's vernal equinox, the official term for the astronomical start of spring, fell on March 20, when the photo was taken. Experts from the National Oceanic and Atmospheric Association (NOAA) captured the image using its GOES East satellite. There are two times each year, in March and September, when the amount of daylight and darkness is nearly equal at all latitudes - know as an equinox. During an equinox, which is latin for 'equal night', the sun is directly over the equator at noon. 'The 'nearly' equal hours of day and night is due to refraction of sunlight, or a bending of the light's rays that causes the sun to appear above the horizon when the actual position of the sun is below the horizon,' according to the US' National Weather Service. The equinoxes are related to the axis of the Earth and its orbit around the sun, which are not fixed. This is why the 2018 spring equinox did not fall on the same date as the spring equinox in 2007. The days after the spring equinox will get longer and culminate in a summer solstice, which marks the longest day of the year. While March 20 marked the spring equinox in the Northern Hemisphere, the Southern Hemisphere celebrated the autumnal equinox, which marks the beginning of autumn.